Dimensions: 14.75" x 8.25" x 1"
Dimensions: 14-1/8" x 7-5/8" x 1/2"
White Puff Pad Plain Earring Cards, 1.5" x 2"
Dimensions: 14.75" x 8.25" x 1.5"
White Puff Pad Plain Earring Cards, 1" x 1"
Dimensions: 14-1/8" x 7-5/8" x 3/8"
White Puff Pad Plain Earring Cards, 1.5" x 1.75"
Present your jewelry at shows and convention with jewelry trays, jewelry rectangle display pads, jewelry flocked trays, or jewelry display pads from American Retail Supply. Our jewelry trays and inserts can hold many earrings, rings, and bracelets with their 14.75 inches x 8.25 inches. Jewelry inserts have compartments to place small jewelry, whereas, jewelry trays can fit bigger jewelry and free of borders. 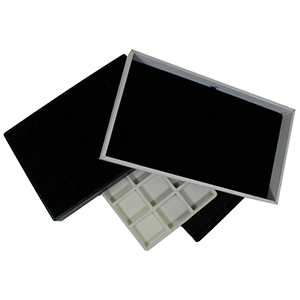 Our mix of jewelry trays and inserts are made of faux leather or plastic. All of have padding to protect jewelry from easily scratching. Shop with American Retail Supply to find diverse jewelry store supplies. Call 1-800-426-5708, to speak with LIVE person of any questions.